I found it in the April 2019 edition HERE. 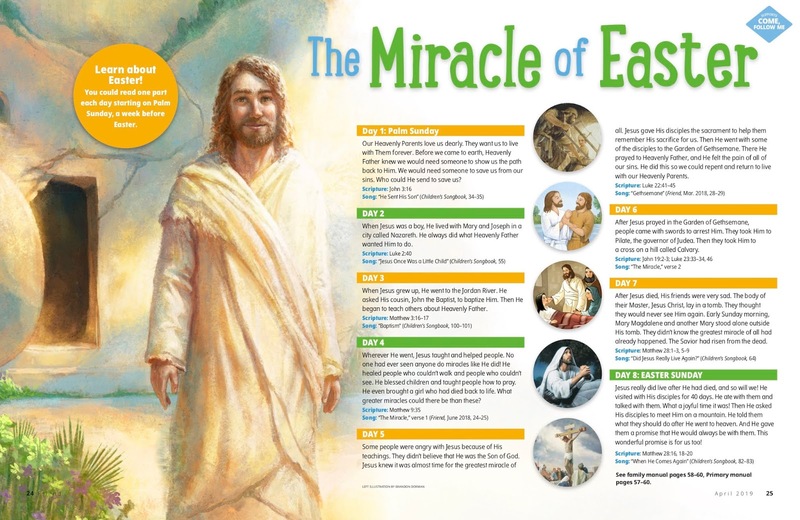 My plan is to use this lesson plan on Easter Sunday but I've heard a few wards are only have sacrament meeting on that Sunday so make sure to plan accordingly! I would suggest simply removing the page directly from The Friend magazine itself to hang on the chalkboard (just as a simple visual). Then have the kids read from a cheat sheet (below) at the microphone that has all the content. If you need to print, I couldn't figure out how to get the one online to print onto 2 regular sheets of paper so I created a version HERE that you can print at home. If you want to do a big poster, you can download and print my 20x30 JPEG version HERE (for Costco) or my PDF version HERE. It's pretty straight forward to implement in primary. Read about each day, the scripture and sing the song. I'll have kids come up and read from the microphone just for fun (if they can't read, either me, a teacher or a Sr. primary child will help them). **For large primaries, assign each class a day & scripture and have them stand and read their assignment together. For small primaries, assign each child a day and scripture. For combined Jr. and Sr. primaries, assign an older child with a younger child and the pair can come up to the microphone and have the older child help the younger child read the part. Find details HERE about viewing sing-along videos in primary if you need. Or another option is to pass out egg shakers (ya know - it being Easter and all!) like I have HERE and have them shake to the rhythm of the each song. Just to provide some movement. To get through all of this, you'll have to move quickly between each of the days. Before primary, you may want to pass out assignments to kids so they already know who is coming up. I'd recommend cutting up a 2nd cheat sheet to pass out to kids as they come into primary. Or, spread this out over 2 Sundays. I'll also be implementing this lesson plan at home for our Family Home Evening Lesson! A double win!! Make sure to scroll through all of my Easter lesson plans HERE for more Easter singing time ideas. This is great! Thank you so much for sharing all your great ideas!